Food is one of the biggest highlights of our trip to Marfa. The delicious food and amazing hospitality made Abi-Haus the most memorable of all. 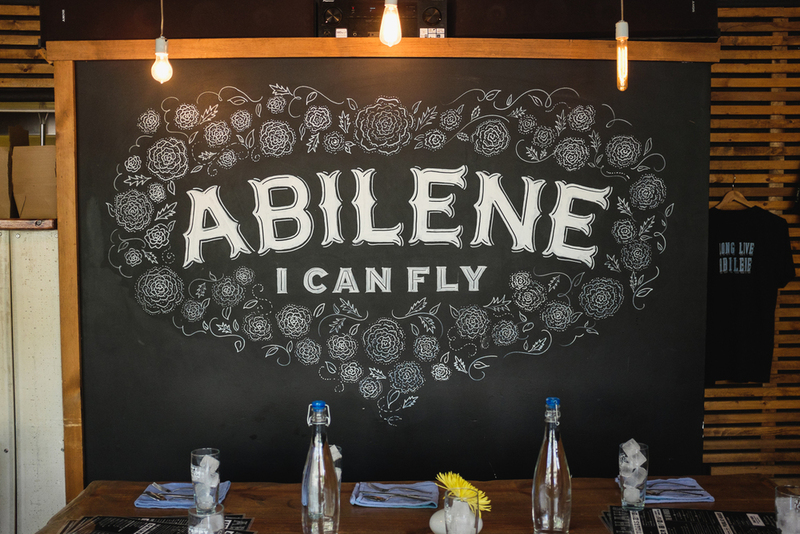 When we first started planning our trip to Marfa, someone happened to mention that we would be passing through Abilene. As soon as I heard “Abilene,” I knew we had to stop by Abi-Haus. I knew nothing about the restaurant except that Dana Tanamachi and Ryan Feerer’s chalk art adorned their walls. I just wanted to go see it! We got to Abi-Haus around 5:50, not knowing they were not open til 6. I’m glad we got there a bit early, though, because we were really able to enjoy the exterior space of the restaurant. There was already a small crowd by the time we got there but we were lucky enough to be the first ones to walk in. The interior is visually inspiring and so unique to this space. The chalk art is just as impeccable and as beautiful as I imagined it would be real life. What talents! Literally studying the menu, it was difficult to choose because everything looks so delicious! We settled on a Cheap n’ Cheesy, a side of Mac & Cheese, and a Farmer’s Plate. While we were waiting for our food, we quickly spotted Jimbo, who was clearly the owner of the joint. We had never met him before and he was running around the restaurant, just as busy as the servers and bartenders, but we could just tell that this is his place, his house, and all the patrons are guests in his home. He came over and chatted with us for a bit - he is such a genuine guy who is so passionate about what he is doing, serving the Abilene community great dishes! ... and I'm on my phone looking through my snapshots of the restaurant! As our plates were delivered to the table as prepared, we knew it was going to be a great dinner. Let me tell you, the Cheap n’ Cheesy is definitely cheap at $5 but the quality is top-dollar! The beef burger patty is cooked to perfection, with the slightest bit of pink in the middle, the cheddar cheese is slightly tangy and gooey, and I’ve never tasted such a deliciously toasted bun! The frites were fried perfectly and the pickles just as yummy, too. The burger also came with a side of their house made ketchup, which was so good and unlike anything I'd ever tasted! The Farmer’s Plate, I could have licked the plate clean if it wasn’t inappropriate to do so in public! The dish was filled with buttered and toasted sourdough, 3 kinds of cheeses (goat cheese, bleu cheese, and brie) with assorted fruit. The best part was the honey hiding underneath all of the bread in the center. The combination of the tangy and creamy cheeses, the tartness of the fruit, and the sweetness of the honey was heavenly! The Mac & Cheese was also so good! Jimbo came over and asked us, “Do you guys like spicy?” After we chimed, “yes,” he brought us some of their house made buffalo wing sauce. He said that their Mac & Cheese with the sauce was his favorite 2am snack after a night of working the restaurant. It was indeed delicious! and I will indeed crave it at 2am! I apologize that we don’t have a photo of the Mac & Cheese, but now you have another 1 out of millions of other reasons to come see it and taste all that Abi-Haus has to offer for yourself! Learn more about Abi-Haus here. All photos were taken with a Fuji x100s camera. We are so excited to be spending the next 4 days with them! And who wouldn’t be? Look how cute they are! Jenn, looking gorgeous! at the restaurant. The sun was starting to set just as we stepped out of the restaurant. The soft light was so nice. Oh, and one more of my favorites of Jon and Jenn! We will be with the Sprinkles for the next 3 nights at hotel El Cosmico in Marfa. Follow us on Instagram to see posts from our trip!